On top of Shanghai metro Line 4's Puhuitang depot on Guilin Road is a 36,300-square-meter garden. Where there was once only roofing asphalt, 59 varieties of plants are now thriving. While the garden certainly looks more beautiful than the asphalt, the roof was actually "greened" for other reasons. The soil mixture and vegetation is a highly effective insulation - on one day in August with the temperature above 40 C, the interior temperature of the depot rose to just 34.3 C without air-conditioning. At Shanghai metro Line 1's Meilong depot, which has a conventional roof, the inside temperature on the same day was 38.1 C.
The Shanghai Shentong Metro Group, the city's subway operator, has created six roof gardens (covering some 150,000 square meters) designed to bring temperature relief to workers in areas where air-conditioning cannot function. Other companies are installing roof gardens hoping that these will also cut their power bills. Zhao Dingguo, an expert in roof greening with Shanghai Academy of Agricultural Sciences and the vice chairman of International Rooftop Landscaping Association, monitored two identical rooms equipped with the same air-conditioning systems. He found there was a 2.49 kilowatt-hours daily usage difference between the room with a green roof and the one that did not have one. That would mean a monthly saving of about 46 yuan ($7.51) for a home or 69 yuan for a business. The good effects of roof gardens last the year-round - experts say in winter they help prevent heat loss. This is the major reason why the municipal government and scientists are promoting roof gardens in the city. If 10 percent of the 70 million square meters of conventional roofs in central Shanghai were greened, Zhao said, there would be a saving of 8.75 million kilowatt-hours in electricity consumption over the 100 hottest days of the year. There's international backing for green roofs as well. The United Nations Environment Program has said that if 70 percent of a city's roofs were greened, carbon dioxide in the air would be reduced by 80 percent. 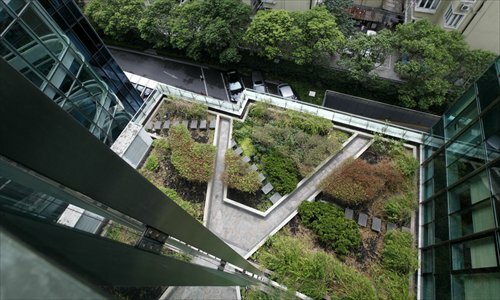 Shanghai's green roof campaign began in April 2001, when a pilot project involving 47 buildings was launched in Jing'an district. Other districts soon followed. Today, alongside the building that houses the Shanghai Municipal Finance Bureau in Jing'an, the Minhang office of Shanghai Municipal Afforestation and City Appearance and Environmental Sanitation Administration, is topped with a 200-square-meter garden as does the building of the municipal government in Huangpu along with many other government department offices. Some shopping malls have also built gardens on their roofs - like the Bailian Youyicheng in Yangpu district, the new Super Brand Mall branch in Xuhui district and the K11 in Huangpu district. Tongji University and the Shanghai Minli High School are two of several educational institutions that have put green roofs on buildings. Roof gardens are not confined to public buildings. The main building of the Shanghai headquarters of one leading online game developer boasts an attractive 15,000-square-meter green roof with beautiful primroses and flowering stonecrops. Residential buildings have also been involved. One high-end residential neighborhood in Pudong New Area has greened several of its complex buildings. Many of the skyscraper residential buildings along Zhizaoju Road in Huangpu district have gone green as well. The roof gardens come in different varieties. Some elaborate versions include small trees, bushes, flowers, grass, cobbled paths, benches, bridges and ponds. Others include pot plants and grass and some just have a grass covering. Roofs with a slope of more than 5 percent usually just have grass or grassland plants. Expert Zhao told the Global Times that in Shanghai most people preferred the more enduring and beautiful roof garden styles but were put off by the high cost and, sometimes, the bearing capacity of the buildings. He said the most common type of green roof found in the city was ground-cover roof greening. "There is grass roof greening which can only be created on accessible roofs - the area surrounding the Mercedes-Benz Arena is a good example of this. The more widely-adopted is crassulaceae roof greening, which is light and less costly. However, there are drawbacks - these plants cannot be trodden on and they need maintenance every two years." The flourishing of the city's roof gardens has been remarkable in recent years. Figures from the Shanghai Municipal Afforestation and City Appearance and Environmental Sanitation Administration show that by the end of 2012, Shanghai had 1.45 million square meters of green roofs - a big jump from the 350,000 square meters in December 2010. One of the reasons for the bloom in roof gardens is the funding policy that the Shanghai Municipal Development and Reform Commission, the Shanghai Urban Construction and Communications Commission and the Shanghai Municipal Finance Bureau announced in August 2o12. For the first time, roof greening for energy-saving architectural projects was guaranteed a subsidy. Buildings that include a green roof area of more than 1,000 square meters qualify for the subsidies. Each square meter of garden-style green roofing attracts a 200 yuan subsidy, while those with just grass cover are given a 50 yuan subsidy. Bian Lei works for Huihe, a greening company in Shanghai. She told the Global Times that on average, garden-style roof greening would cost 250 yuan a square meter and a simple grass cover would cost 100 yuan per square meter. The Shanghai Municipal Afforestation and City Appearance and Environmental Sanitation Administration told the Global Times in an e-mail interview that it had received applications for subsidies worth 20 million yuan last year. "This policy has pushed Shanghai's greening campaign forward considerably, and there is a constant increase in the number of businesses and institutions adopting garden roofs." Despite these encouraging figures, it is not at all the case that roof gardens have been widely adopted. In March, the Wenhui Daily pointed out that Shanghai has about 19 million square meters of roofs suitable for greening but a mere 7 percent have actually been greened (most developed countries have greened between 15 and 30 percent). The paper suggested that the 1,000 square meter limit was a problem for a quicker widespread acceptance. 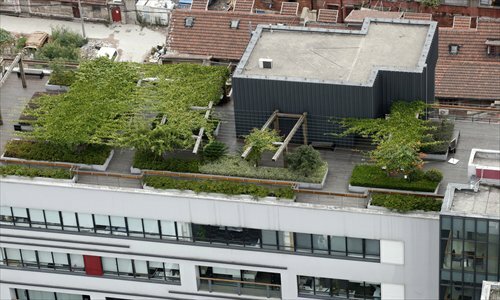 But the Shanghai Municipal Afforestation and City Appearance and Environmental Sanitation Administration said the threshold was set because the funding policy was established in the hope of creating obvious and visible "models" for roof greening. Another reason that green roofs are not springing up in Shanghai, according to the administration, is that at present only new institutional or public buildings like sports or cultural centers ought to adopt roof greening. "Projects that do not adopt green roofs will face obstacles in obtaining approvals," the administration noted - without clarifying what sort of obstacles could be involved. The administration confirmed that it is currently not mandatory for other new projects to include green roofs. 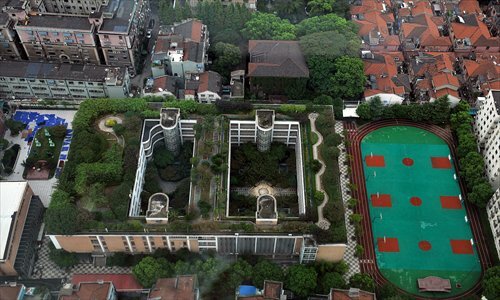 The Sichuan Province capital, Chengdu, has adopted a different approach to roof gardens. In 2005 the city government ordered that all new buildings under 40 meters tall had to have green roofs that would cover at least half the roof area. Buildings that did not have this would not be officially approved by the government. Buildings above this height were encouraged to provide roof gardens. According to a report in the China Flower and Gardening News, by 2008 Chengdu had more than 3 million square meters of green roofs. Countries around the world have adopted different ways to encourage roof gardens. In 1982, the German federal government was offering a 50 percent subsidy for roof greening and some city governments even offered to cover the entire cost. Putting icing on the cake, German cities offer the owners of buildings with roof gardens a 50 percent property tax cut for five years. In 2001, the Japanese government ruled that developers of residential buildings larger than 1,000 square meters and public buildings of more than 250 square meters must have green roofs or be fined. In Singapore, all buildings designed after 201o must have green roofs. Although the Wenhui Daily reported that the Shanghai Municipal Afforestation and City Appearance and Environmental Sanitation Administration was pondering a revision of the current regulations early this year, changes will not happen quickly. "This policy will continue to August 2015. Then adjustments might be made," the administration told the Global Times. The administration said that it intended to add 1 million square meters of green roofs between 2011 and 2015 - it did not reveal the number of green roofs expected by the end of 2015. Green roof policies, in and outside China, seem to favor new buildings. Whether older buildings can readily accommodate roof gardens is still being debated. The administration said it did not advocate green roofs on older residential buildings for safety reasons and because residents would have to agree to them. But green roofs on these buildings could be approved. "Apartment owners in a building would have to agree to install green roofs because the properties are shared. The buildings would have to be physically capable of accommodating green roofs and it has to be clearly stated who would be responsible for construction and maintenance. If someone proposed a green roof for an older building and could meet these provisions, they would be entitled to the subsidy," the administration said. Expert Zhao agreed that old buildings had to be treated carefully for roof greening. "Buildings have to be examined properly to assess if they are too old to have green roofs. There are many other issues like watering, draining security and fire prevention to be taken into account, too." He said that a lack of professional expertise in Shanghai has made greening more difficult for buildings old or new. "The companies that are qualified to bid for roof greening projects do not actually provide the service themselves and the contractors who do this work are small companies that rarely adhere to the building codes involved."